I have two outlets at the bottom, so I think that it might be smart to put two small electric humidifiers in 1 above and 1 below the drawers, and then put boveda packs in the drawers. 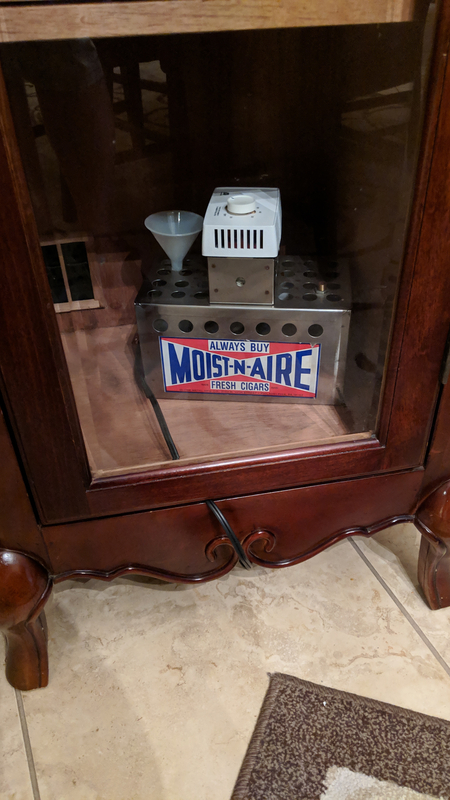 What's wrong with the Moist-n-Aire? Probably be able to add a better controller. But that is the brand most shops use. Hydra is ok, but if you get a "home" electronic humidifier, the first thing you will want to do is remove the green foam crap they use and put beads or crystals in it and clean them once every 4-6 months. The hydra is fairly quite, but the alarm on it is annoying as hell and most often, I turn the alarm off. Cause it usually runs out of water at 2:00 in the morning and the alarm goes off. But I can also tell you that in Vegas, you will most likely need 2 hydras to keep up with that cabinet and they will be just as noisy as 1 Moist-N-Aire. Another option is to get 5 lbs of beads. LOL! Or maybe a 20 pound sack of boveda! Does it make good use of air circulating fans? That to me is what I would be concerned about. That is a good system. I'd try kitty litter. (100% silica cat litter, unscented) Works like heartfelt beads. Way cheaper. If you screw up the first batch you can toss it and start over. I don't know much about it but, that machine looks like it could handle a humidor five times as big. Just tell the boss you can't even hear it... over her ****', that is. Her **** is epic for sure! That's not a bad idea. I'm seasoning it with the humidifier now. I boolmarked a couple of good threads on it in the forums and I read through all of them. I also did the calculations on the website and doubled it to figure out I'd need about eight pounds. I think I'll put a little on each shelf all the way through. Picked up a 17 lb bag. 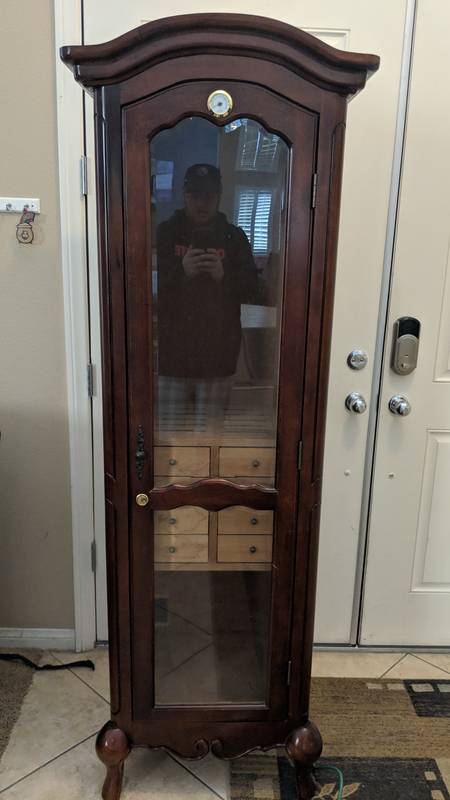 If it works, I'll offer up this unit on the forum to someone who needs it. Hey! 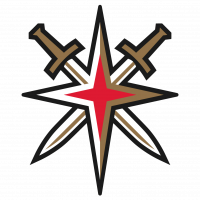 What's the big idea, doing your own research and reading old threads?!? You're supposed to ask all questions here first, and never searching on your own! Somebody send me some nachos so I can reward this guy's behavior. I'm a fat guy I love nachos! Double check the claim of "unscented" before you get too far along. Take a few spoonfuls out and spray it with water. I've had some litter in the past that did not label itself as either unscented or scented. It was scented. Smelled like that old glade spray can stuff everybody used to keep on the back of their toilets. Thanks @Bob_Luken I'll definitely do that. I bought the exquisicat brand. It's seven pounds not 17 pounds. I'm going to try with this and if I need to go get more I'll go get more. Probably still have five or six days left on the seasoning anyways. You won't need more than 7lbs. What are you going to put the KL into? Haven't decided. Obviously I could make the homemade nylon sacks or use some small Tupperware, but I think I want something that I'm not going to mind looking at. I was considering making some custom containers out of some sort of screen material with a wood frame. The other option I was thinking of was finding some rectangular plastic containers and drilling a bunch of holes in them. Any suggestions? Is it just me or do all wives have super sonic hearing and sense of smell? Not just you, that's why I was applying more weatherstripping to the door into the garage last night before I started roasting coffee. Wow @peter4jc that sounds super cool...examples? I never thought of using those, Edward. When the beads need moisture I spray some distilled water on them, and I wonder if the muslin bags would get moldy? A shallow tupperware thingy would work well too, just keep the top off of it and use caution when moving it. After a gallon of water in five days, she never got above 75% in the middle and 67% on the bottom. The humidifier ran Non-Stop from Saturday to Friday and the humidity was holding constant at those rates for the last 4 or 5 days. I figured a gallon of water was a good indication that it leaked. I put some small weather stripping around the door jamb and voila! She went right up to the high eighties. The control unit on that saying by the way was reading at about 50% when the RH was in the low 80s. Now it's just a matter of fiddling with it so that I know where to set the dial for the humidity that I want. I'm probably going to start off trying to maintain 70% since it is winter and a little more humid than normal. Now that this thing is pretty airtight, I most definitely think that I can get away with something smaller to manage humidity. Frank, I have the same “hugemidor” as my wife named it! 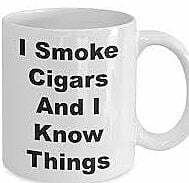 I have used the Cigar Oaisis for years. Because it is the larger model I have a timer on it to humidify 12 hours a day. That also allows you to have no noise during your wife’s waking hours! 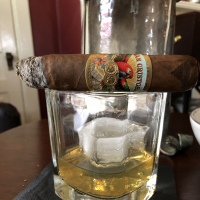 Every cigar comes out wonderfully ready to smoke. Great idea on the timer! Sometimes....I wish my wife had a timer.